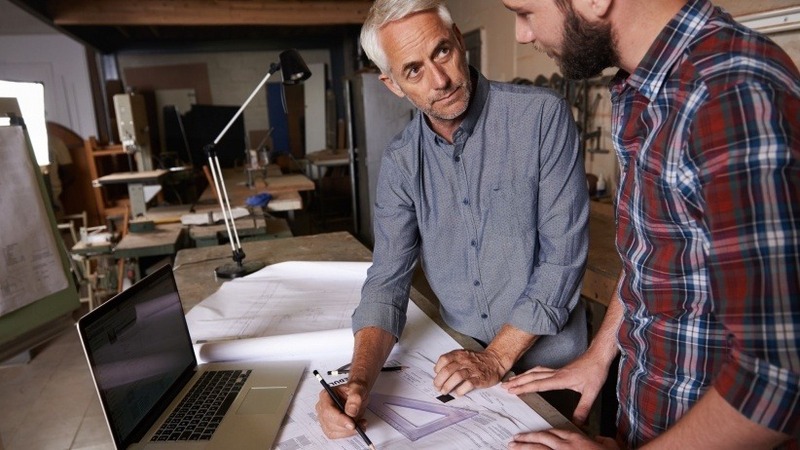 The idea of hiring your family to help get your startup or small business going presents some advantages, such as them working for a reduced wage until cash flow increases. You may feel that family are the only ones that you can impose upon that much. As a whole, your nearest and dearest are also pretty reliable and trustworthy. They’re probably not going to throw you under the bus, but there’s also a lot of reasons why you shouldn't hire and work with your relatives. When I got married I thought working with my spouse was a grand idea. All of the above reasons were true. Little did I know that it would severely damage our relationship. Here are 25 reasonable reasons it's probably not the best idea to work with another family member. Perhaps the biggest problem when hiring or working with family is that you don’t have the leverage you would have with other colleagues. This may include asking for rework, negotiating prices or getting tough when a deadline approaches. Conrad Neuf, a former senior construction manager for Toll Brothers, saw this situation throughout his career. Neuf observed if a homeowner wasn't tough with a contractor or repairmen it turned out to be a family member or a friend. "Whenever you're dealing with a friend there is another element that enters into it that would not be there if it were a strictly business relationship with a stranger," Neuf said. "You lose a lot of leverage. You're unlikely to put your foot down for a lot of things. Everything is weighed by the fact that you could cause problems in the relationship or family." There are people who have the amazing ability to separate their personal and professional lives. They have learned to completely shut off work once they leave the workplace, but they’re few and far between. Most of us will inevitably bring work home with us -- whether it’s the frustration or sending emails when it’s time for dinner. Adding family to the mix means the need for a greater concentration of balance. Birthday parties, barbecues, reunions and weddings are not the time to air the business. You don't want tensions brewing at the office to boil over in front of the entire family. Occasionally, the balance can be thrown off by the spouses of those family or friends working together. The spouse may come home and complain in confidence, then the spouse brings up the situation at inappropriate times. It’s awkward and could be serious enough that it ruins the entire function. There has to be strict rules governing conversation outside of work hours. Try as hard you can, you simply can’t avoid the reality that emotion is a part of every relationship and how that can lead to a messy work environment. For example, if you have a talk with your cousin about their performance. Maybe you offer some advice on how they can make the proper adjustments. Any other employee would just say, "okay." But a relative or friend may take something personally because of your existing relationship. Messy. Then there has to be the time involved to solve the point of contention. You may think that you have the perfect family and there’s no baggage between family members. I hate to be the bearer of bad news, but that’s never the entire truth and no matter how big or small, all of that baggage will come to light during stressful situations. You knew that your brother is still upset that your parents didn’t attend every one of his baseball games. The parents sure came to your events. You probably didn’t know it was still a controversy in their mind -- until you started bickering about work-related issues. It’s very unlikely that any of your colleagues are going to speak freely about your relative. That may be a good thing if it prevents gossip, but what if the issue needs to be discussed? Generally speaking, your other employee's are already talking about this -- just not to you. Maybe your nephew is incompetent and constantly making mistakes. Do you think anyone is going to mention that to you? Whether you’re a freelancer or run a small business you should always sign an agreement or contract with your clients or customers. This is a protection to both parties. It places you both squarely on the same page. You will both understand the expectations when it comes to the scope of the work. The contract clearly explains how and when you’re going to get paid. When working with a family member, however, you may be hesitant to ask them to sign a contract. You want to avoid this uncomfortable situation even if you know clarification is necessary. While not each and every family member is guilty of this, their are some who take advantage of being a part of the family to ask for time off, miss deadlines, come in late, go home early or presume their authority. As the boss, you may not even see it but your other employees will. The only way for your business to scale is by surrounding yourself with specialists in their respective field. You must have those who are qualified enough to help you move forward. Bringing in family doesn’t guarantee the highest quality. Even though you have good intentions, that may actually do more harm than good. Have you passed over a better candidate just for the sake of working with a friend or family? You don't want any of your co-workers to believe that your relative is getting VIP treatment. As a result you assign him or her even more responsibilities. Your relative might not appreciate this and is now getting stressed out over the additional workload. Or the opposite happens and you start going easier on them because you know that your family member is having a hard time. As a result, you pass their responsibilities to other co-workers. How do you think they’ll respond? When I was in university there was a referee at the basketball games who was a professor at the university. We always hoped he would not be the ref. We knew absolutely that we would lose the game if he was the ref because he would be so completely fair that he was unfair. Family member fight with each other. That’s what families do. Most of the time it’s over minor situations that are resolved in due time. Once business gets involved, there’s no reversing the relationship when things go sour. My dad and uncle started a business years ago. It didn’t pan out and they really haven’t spoken since. Trying to juggle that fine line between work and your personal lives becomes increasingly difficult. Does your cousin go tell your aunt and uncle what's going on at work? Did another cousin come and say, "Hey, so sorry to hear your customer base is down." They tell all the dirt on a new employee, who you didn't know lived up the street from grandma. If those lines weren't blurred before, then they definitely are now. Don’t believe me? Make it rain at your next family function and see how insane your otherwise reserved relatives react. Now think what happens if your business takes-off, or you get a raise. What if you're a seasonal business and can’t pay your employees/family? Everything from jealousy to resentment to anger is going to start creeping into the relationship or into your business. When you have a careless employee you can hold-back bonuses or even give them a pink-slip. Although it’s harsh, and always difficult, that’s a part of business. But, when dealing with family, how can you fire your cousin when you know the entire family is going to hear about it? What if the family is against your decision, and they are not bothered by mixing in this business concern? How about the family member who has to come and give you some "friendly advice," so you will get it? Why would a relative be motivated to put their best foot forward when they know that you’re not going to criticize them. What if they believe you will definitely never fire them? I’m not saying this is always the case, but when you don’t provide your family members with constructive criticism how can they improve on their weaknesses? Since you’re family, it’s not surprising that your relatives feel comfortable enough to tell you what’s best for your company. Even worse? You can’t tell them to mind their business because, well, they’re family. You’re going to fail. It’s a fact that you need to accept and learn from. But, when you face this adversity you want your family to be there to support you. Other's entangled with your business’s failure can make everything worse. It makes a bad situation even worse. When you bring-on a family member you only view their awesome and unique qualities instead of looking at their flaws. Maybe they’re not a good fit for your business. I have cousin who is an extremely talented graphic designer. I would love to have him as a part of my team, but he’s not always the most reliable and is known for constantly flaking out. As mentioned earlier, when there’s beef at work, it could impact the entire family. Lines are drawn and sides are chosen. The family is now divided because of the work relationship soured between you and your family. At the same time, even though your family member works for that doesn’t mean that they’re a decision maker. However, others on the outside may not be aware of that fact and associate your relative with your business. That’s not always a problem, but if they rub someone the wrong way, then it's guilt-by-association. You’ve brought on your sibling or cousin and your colleagues are well aware of it. Most days that’s not a biggie, but it does when your family member starts getting recognized for their work. They’re not going to say it to your face, but there will be people who believe that the sole reason for your relative’s success is simply because they’re related to you. 20. Do you really know them? While some relatives are extremely close, do you tell them about your shortcomings? Probably not. You save those conversations for your spouse or best friend. Even though you’re little brother tells you he’s successful, can you be certain of that? What exactly does he do? How did become so successful? What can he bring to the table? If you don’t know, then why consider him as a partner? Having some alone time is actually beneficial since it helps with productivity, and gives you a chance to recharge. Studies show that alone time boosts your self-esteem. It makes you appreciate people more, and increases your emotional intelligence. Unfortunately, you may not have as much alone time when working with a family member like your spouse. It’s not uncommon for families to view agreements, commitments, and deadlines as suggestions. They are not seeing something that is important and absolute. After all, you’re their cousin and not the boss. That can be problem when you miss a deadline for a high-profile client. How can they trust you moving forward? “Generally, it’s better to let things out than hold them in. And doing so feels almost akin to problem-solving—in the moment, at least,” writes Leon F. Seltzer, Ph.D. In short, healthy and limited venting can be a good thing. But, who can you vent to when working side-by-side with your spouse, sibling, or cousin? Spending almost 24/7 with someone start to feel like a chore instead of genuine time spent together. As I mentioned above, we all need some alone time alone. We need to spend some time apart from our loved ones if we want to preserve those relationships. In an ideal world, doing business with those closest to us would be both a risk-free and rewarding experience. Sometimes that happens. But, what about the worst-case scenario of a the business closing? Not only is your livelihood in jeopardy so is your family members. That’s a heavy burden to place on your shoulders. And, even if they get back on their feet, don’t be surprised if they hold some resentment towards you.